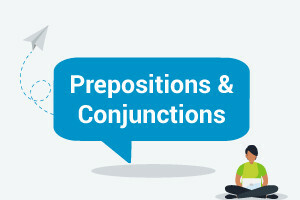 Prepositions and conjunctions form important parts of English sentences that every English learner has to learn. This course will guide you through the different uses of prepositions and conjunctions so that you can understand them easily and express yourself more clearly and precisely. The course also features audio recordings of native English speakers so that you can improve your listening skills. All, for free! This English grammar course will first teach you when to use 'although' and 'because'. You will then study the differences and similarities between 'despite', 'in spite', 'though' and 'although'. You will learn that you use 'in case' when preparing for something that is unlikely to happen, and that 'unless' and 'not unless' are used in negative English sentences. You will also learn how to use 'if + not' instead of 'unless'. The course will then cover the prepositions 'as', 'just as', 'when', 'because', and 'since'. You will then study the different ways you can use 'verb + like to', 'as though' and 'as if'. The course will also cover 'for', 'during + noun', 'while + subject + verb', 'while', and 'during'. You will learn how to use the past form of English verbs to talk about the present and the present form of the verb to talk about the future. Finally, you will study the uses of 'by', 'until', 'till', 'by the time', 'by then' and 'by that time'. Expressing yourself in English will be so much easier once you have mastered prepositions and conjunctions. You will sound more fluent, and be ready to take on much more advanced English skills in your next lesson. This will be a great boost for your confidence as you move forward with your English training and have more conversations with English speaking people. So, start the course now and in a few short hours take your English to the next level. Explain how conjunctions provide extra information in sentences. Describe how conjunctions are used to give us information, make comparisons, predict the future and make suggestions. List examples of using nouns, pronouns and -ing words with conjunctions. Relate which prepositions we use to talk about time, distance and states. State which words and phrases are used to describe preparing for something that is unlikely to happen. Review why we use the present form of the verb to talk about the future. Analyse which words/phrases we use to talk about why we did something in the past or what we should do in the future. Trace how certain words/phrases refer to states or outcomes that depend on other factors.